Boris Yeltsin was a Soviet and Russian politician and the first President of the Russian Federation, serving from 1991 to 1999. 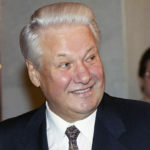 Originally a supporter of Mikhail Gorbachev, Yeltsin emerged under the perestroika reforms as one of Gorbachev’s most powerful political opponents. During the late 1980’s, Yeltsin had been a member of the Politburo, and in late 1987 tendered a letter of resignation in protest. No one had resigned from the Politburo before. This act branded Yeltsin as a rebel and led to his rise in popularity as an anti-establishment figure. "We don’t appreciate what we have until it’s gone. Freedom is like that. It’s like air. When you have it, you don’t notice it." "We want peace and a political solution to the situation in Chechnya." "I would like to stress here that a lasting peace in the Chechen republic and so-called peace talks with the bandits are not the same thing, and I would ask everyone to make no mistake about that."